Teresa Alvarado leads SPUR’s work in San Jose. She formerly served as a communications and community engagement executive with the Santa Clara Valley Water District and as the first executive director of the Hispanic Foundation of Silicon Valley. Earlier in her career, she worked in government relations and corporate philanthropy for Pacific Gas and Electric Company. A San Jose native with a long history of civic leadership, Teresa currently serves on the boards of San Jose Jazz, the Silicon Valley Leadership Group Foundation and Hispanas Organized for Political Equality (HOPE). 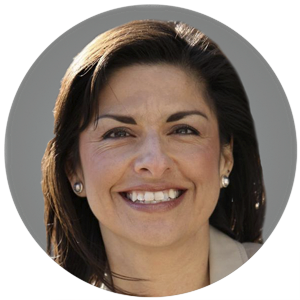 She is founder of the Latina Coalition of Silicon Valley and serves on its advisory board. Teresa is a former board member or advisory board member of SPUR, Greenbelt Alliance, the Rotary Club of San Jose, CompassPoint Nonprofit Services and the Silicon Valley Education Foundation. She was an appointee to the City of San Jose’s Envision San Jose 2040 General Plan Update Task Force and was the first community member appointed to the San Jose Mercury News editorial board. She holds a Master of Science degree in civil and environmental engineering from Tufts University, a Bachelor of Science degree in environmental technology and management and a minor degree in technical writing from San Jose State University. She is a graduate of the Harvard Kennedy School of Government Executive Education’s Women and Power: Leadership in a New World program, the Tuck Executive Education at Dartmouth’s Brand and Reputation program and is an American Leadership Forum senior fellow.